That’s easy, I’m not! Maybe I should end my post here but that’s not the point is it? Although Natalie advised us to work on three social media tools and I didn’t choose Google+ I thought I should use this challenge to explore the medium more. I’ll own up to not doing so earlier because I have a thing about big business taking over the world, it’s why I rarely shop at Tesco, and I think of Google that way. Now I have spent a bit of time exploring I have to say I like what I see. I’ve now filled out my profile though I could do with an alternative photo and I’ve posted an event, an update and a photo. My next job is to get my You Tube videos to show up on my page. I have set up a few circles and added people who I could find easily to them but it still looks like I’m ‘Billy Nomates’ so I need to work harder to find people to connect with. I’ve posted an event and will add another couple shortly. However this is all stuff I already do on Twitter, Facebook and Linked In so it were not for Hangouts I wouldn’t see much point in being on Google+. I’m excited by the opportunities that Hangouts offer especially for a trainer and business adviser like me. I’m going to stick my toe in the water shortly with an online version of my Business Workout sessions. I’ll be inviting some of my regular customers to join me for the test event in case it all goes pear shaped. I think these could fit really nicely with my business development strategy and can see how they could help at least one client too. Given that Google is constantly open on my computer it will be easy to post to + fairly regularly so I’ll make it my fourth social medium and see how it goes. Here’s a preview of my page. This entry was posted in Marketing and tagged Facebook, Google, LinkedIn, Natalie, Social media, Twitter, YouTube by glendashawley. Bookmark the permalink. Thanks for being so open Glenda and sharing your thought processes. I had similar thoughts on Google+ for today’s challenge, then almost straight away got my first hangout request. I also share some of your reluctance to support some big companies, but Google isn’t one of them for me – like all big companies, they started small with just an idea and a couple of people. I have friends who work for Google and they’ve never been happier in a workplace, plus Google gives individuals and small businesses amazing tools (many of which are free). 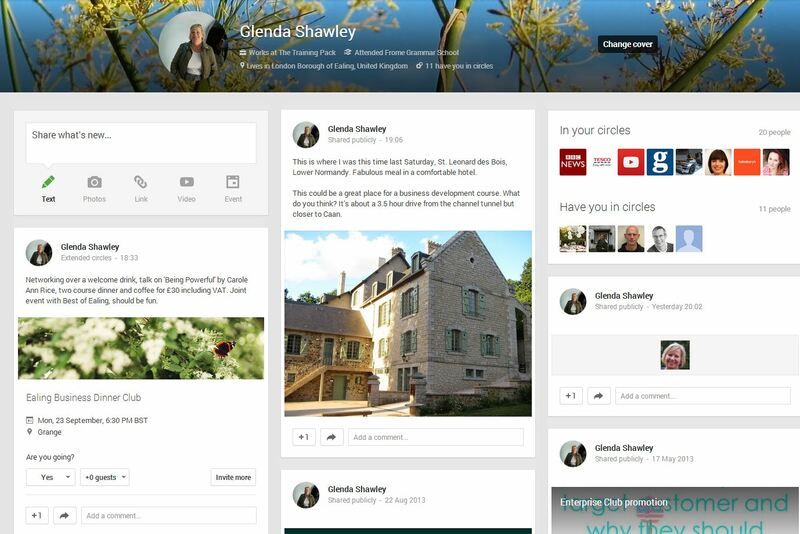 After a little tinkering with a Google+ profile, I like it too…I especially like how it’s one place to connect all of our other online profiles. Enjoy your hangouts and I look forward to your next post. Thanks Kirsty, that’s a fair point about Google, they’ve certainly made my life easier in many ways although I’ve also had the odd problem with them. I wish they were a bit less faceless when we have a problem but maybe Google+ will be the way to get in touch next time. We do have to admire Google for their constant innovation too.